Apollo Welspun Deal: A costly affair? As Apollo Global Management LLC (Apollo), the US-based PE fund is cheering its success in the United States, its Indian business is still waiting for a take-off. It has set up a joint venture with ICICI Venture and is investing in stressed assets. Apollo to invested Rs 2,250 crore in Welspun group was one of the largest private equity deals in India in 2011. Apollo invested Rs 1,305 crore in Welspun Corp Ltd. (WCL) and Rs 140 crore and 130 crores in Welspun Maxsteel Ltd. (WML) for 12.5% stake and capital expenditure respectively.It had also proposed to infuse Rs. 675 crore separately in Welspun Infratech Ltd, but that deal had fallen off. Apollo had negotiated a shareholders rights agreement with the Promoters, the Goenka family, such that both would essentially have joint control with no party being able to act without the other’s consent. In a very bearish market scenario during 2011 to 2013, a lot of PE funds struggled to make investments and exit through the capital market route. Also, companies struggled to raise capital from banks and financial institutions. Hence a lot of these funds came out with NBFCs to provide flexible capital raising solutions to stressed companies eg. KKR Financial Services, PHL Finance, Sicom etc. Apollo’s focus in India has been on certain sectors like chemicals, oil & gas, metals and mining, financial & business services and media distribution. Welspun’s unique combination of positioning (cost-efficient, large scale, highest quality) and potential (backward integration and consolidation) cajoled Apollo to pick up the tag for Welspun. Apollo is fundamentally a value investor and in a high-growth environment like India, that translates into being a contrarian investor. It might have an investment horizon of about 5 to 7 years with an exit in sight during which they had an objective of improving the valuation of WCL and WML through improvement in operations–better scale, efficiency and product mix and in the financial front by lowering debt. It had a long term view for Welspun Maxwell because it saw potential in its gas-based DRI (Direct Reduced Iron). However, due to natural gas unavailability and other problems, the company had to sell the business. Through the deal, Welspun wanted to create a backward integration in the company by expanding the capacity of WML.It intended to use Apollo’s expertise and finds to enhance growth and capitalisation of the companies. The declining performance for FY 2011 and 2012 forced Welspun to rethink its plans. Over the past few years, the group has restructured its companies and sold off various businesses. This includes existing infrastructure project and abandoning unnecessary expansions. As Welspun had put its infrastructure business on hold, Apollo sold its 12.5% stake in WML to the promoters at 30% discount to the fair market value at a loss of about Rs. 50 crore and in October 2014, promoters sold it to rival JSW Steel for Rs. 1,030 crore. This move helped WCL to focus on its core business of pipe manufacturing. Apollo got an equivalent stake in WEL as per the share swap ratio of 1:5. In FY 2015-16, the merger of Welspun Enterprises Ltd, Welspun Infratech Ltd, Welspun Plastics Pvt Ltd and Welspun Infra Projects Pvt Ltd into Welspun Projects (renamed later as Welspun Enterprises Ltd.) was announced. It helped consolidate and simplify corporate structure of the group and creation of single infrastructure company. It means that Apollo who holds 13.3% stake in WEL, got around 12.13% of the combined entity under Welspun Projects as per the share swap of 12:1. The declining performance for FY 2011 and 2012 forced Welspun to rethink its plans. Over the past few years, the group has restructured its companies and sold off various businesses. The management team of Welspun failed to accelerate the expected growth and valuation of the WCL and WEL over last 4 years in spite of backing from PE funds. The market capitalisation of WCL and WEL has grown by CAGR of 8% over 2012 to 2016. Given the corporate restructuring exercise was undertaken by the management and WEL following long-term monetisation strategy under the guidance of Apollo, the synergy benefits translating into higher earnings would take some time. One positive sign is that promoters have increased their stake in the company to 41.07% to 44.89% from March 2011 to 2016. 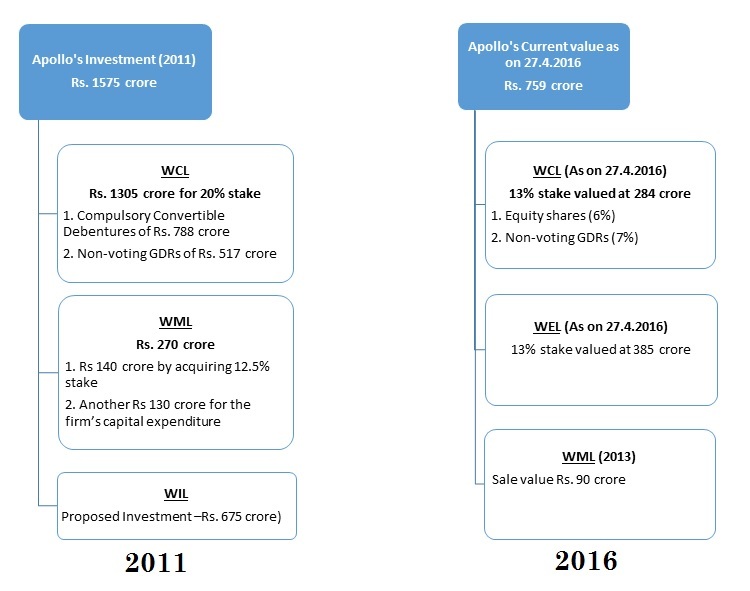 Apollo’s current value of investments has declined to almost half and one third in WCL and WEL of the amount invested showing total unrealised loss of around 40% as on 27th April 2016. In the hindsight, one could say that Apollo’s decision to invest in Welspun could have been better timed to tackle the macroeconomic challenges that affected Welspun’s operations. Also, Apollo failed to foresee the significantly higher operational challenges faced by Welspun. But now Welspun is in the process of being transformed by Apollo into a simplified operating business with one core focus. The various sell-offs and restructuring moves will pile up cash balances which will be used for existing projects. Its financials of 2015 also show some signs of recovery. The management has also been taking various steps to revive the growth of the company. Apollo may have to wait for few more years to get a good return on its investment and to see the effects of economic slowdown, restructuring and deleveraging on the performance of the company.